This article or section is a short summary on unused content in Pikmin. Pikmin has a fair amount of unused content left inside the disc. Most of it is in the form of debugging tools, although unused models, textures and other resources exist as well. Title screen. 0 means the Challenge Mode option won't be visible. 1 means that option is present. A set of voyage log entries. Set #19 is untranslated for some reason. Saved game screen for saving. Its value doesn't seem to do anything. A weird screen with sprites, effects and buttons, possibly used to test their features. Memory card warnings. 0 and 1 don't do anything, 2 warns that the card cannot be used. 4 warns that it must be formatted. Saved game screen for loading. Unlocked voyage logs. Acts weirdly. Pause menus. 0 is during a regular adventure, 1 is during challenge mode. Main article: Olimar's voyage log. There are some unused voyage log entries, some unused untranslated second pages, some Japanese entries that don't relate to regular logs, and a function to display the text "1 day" in some messages that can never do that. There is an unused monolog, an unused function to write a singular or plural word, and a set of files in Japanese. Some unused textures have been found on the game's disc, portraying Red and Blue Pikmin with bomb-rocks. This hints to the fact that, initially, all Pikmin types were designed to carry bomb-rocks. Iwagen is the internal name for an unused object in the game. The name is a Romanization of "rock generator" and, as its name indicates, it spits out boulders, much like an Armored Cannon Beetle. It lacks a health counter, meaning it was possibly planned to serve as an obstacle. Its removal from the game could've come from its odd appearance, and how it does not match the surrounding elements in the Pikmin franchise. It can be found in some unused stages, like testmap. Curiously, It resembles the Withering Blowhog. Screenshot of Usuba in its t-pose. Usuba is the internal name for another unused enemy. The name is a Romanization of ウスバ?, which is shorthand for ウスバカゲロウ?. This, in turn, translates to "antlion". As its name and appearance indicate, it would have flown, though not much else is known about it. Attempting to spawn Usuba by any method crashes the game for an unknown reason. The surprisingly developed parameters for this enemy suggests that it was last developed around the same time as Iwagen. Interestingly, these same parameters suggest it would have been tied for the highest HP of any enemy (at 5000 HP) and supposedly would have spawned Smoky Proggs. However, it is possible that the enemy in Smoky Progg's position changed during development, so the latter fact cannot be confirmed. For unknown reasons, Usuba does not show up in the animation test. Kingback is the internal name for an unused boss. This enemy is simply the "back" of the Emperor Bulblax without the lower body. It does nothing if touched/attacked by Olimar or the Pikmin, and simply pushes back any objects if touched. An infinite spawner for bomb-rocks is present in the files of the game. 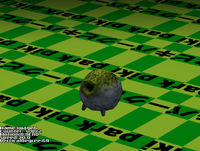 It uses the Breadbug nest as a model and gives an infinite amount of bomb-rocks to Yellow Pikmin, and appears to have been used for basic testing. There is an unused fish generator in the files of the game, which spawns "fish" that move around. The fish have no model, so a white X is manually drawn by the engine instead. This decoration appears to be unfinished and may have been cut early. There are incomplete door and key objects in the game files. They use the unused door and key models and only function correctly in the unused debugger. The key floats in place when spawned and when "touched" by Captain Olimar it disappears and increments an unseen counter. The large door blocks Captain Olimar from getting in a radius of it, but if Olimar has collected a key, it linearly vertically squishes into the ground, at which point it is no longer tangible. 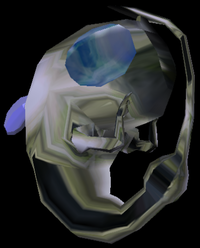 The small door also blocks Captain Olimar, but when touched after collecting a key, Olimar is sent into a state where he cannot move and the door remains unchanged. There are a few animations for the Pikmin that aren't used. There are 2 test blo files found inside dataDir\screen\eng_blo, "test.blo" and "test2.blo"
account.blo contains some weird strings that don't seem to be used. They are "The sun has gone down, today's job is finished. ", which appears twice, "starting pikmins", "pikmins now", "dead pikmins", "enemies defeated" and "collected items", which all appear twice, grouped. account2.blo seems to contain the real text for the results screen. When a Pikmin is held, its throw height is decided to be at a certain level. Holding the Pikmin for a while increases this value, and the increase stops more or less when the Pikmin's noise ends. However, in the game files, the starting value and the ending value are exactly the same, so this feature has absolutely no impact in the final game. Pikmin 2 has the same parameters, but the code to change the value is gone. An unused parameter in aiconst.bin, when set to 1, allows the player to pluck Pikmin by simply whistling at them, like the Pluckaphone in Pikmin 2. The Pikmin come out on their own, with a unique sound an animation. This feature was actually used in the 2000 prototype trailer. This page was last edited on March 17, 2019, at 21:13.